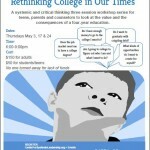 Participants learn beginning Critical and Systemic Thinking methods as they work to explore the value of a college experience in today’s market conditions—including the financial, social and academic considerations. For parents, teens, young adults, counselors and interested community members (Duration: 3 hours, 3 nights). $150 for adults; $50 for teens; no one turned away for lack of funds. To make special arrangements, call 916-864-4858.